Janie at last went to be with the Lord today. Her suffering has ended and even better than that, she is now face to face with her Jesus who she loves so much. She started to not feel well at 9:30 this morning and her breathing degraded quickly through the morning. She never was in any pain and God was very merciful in taking her very quickly; by 1:00 this afternoon she was in His very presence. She was surrounded by her family and she was able to stay right here at home - no more hospitals! It was very sweet and bittersweet and right and if I may say it, a very pure time. Sacred. I hope to tell more of that story for you someday later. Even while we cry, we also celebrate for her because we know in our hearts that she is now filled with inexpressible joy as she is with God in heaven at last. I also want to send out a big thanks to all of our friends and family who have been praying for us for these last six years - you mean so much to us. 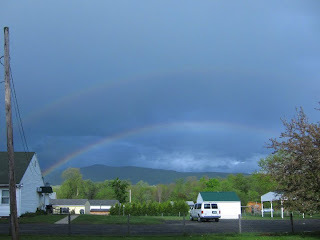 We had a special gift from God this afternoon: He gave us a huge double rainbow! 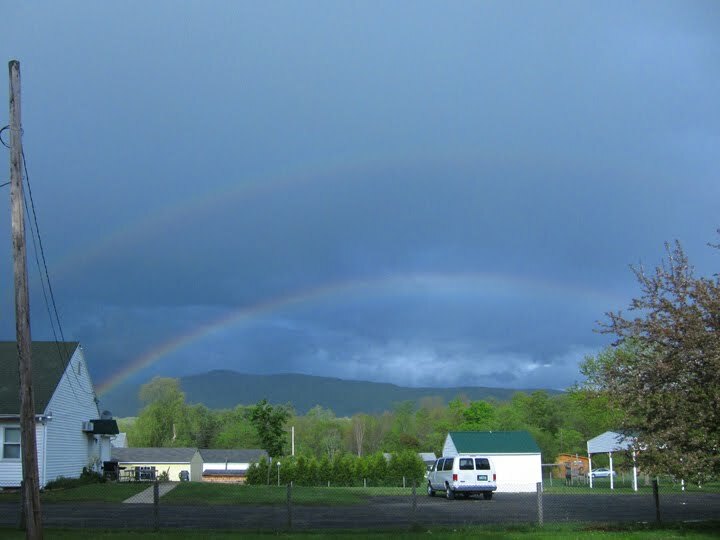 A wonderful reminder that our God is a God who makes and keeps promises (Genesis 9:12-16). And one of His promises that I am hanging onto through this is that he will never leave us or forsake us (Joshua 1:5). We are all being held in his arms, just like he held her all this time. I had to take a picture of it so I could share it here with you. I'll put up some details soon regarding when and where a memorial service will be. I'll give a 'teaser' for you tonight though: she wanted the main verse at her service to be Philippians 1:21 "For to me, to live is Christ and to die is gain." Dear Chris, no words really... just some tears, aching for you and your family, gladness for Janie's freedom, gratitude for God's mercy.. mostly just feelings and thoughts and prayer...with love. Chris...I am so sorry for you all and praying for your family. Praying for Janie's peace with the Lord. Know that you are all in our thoughts and hearts. Chris, I am so sad and have been flooded with Janie memories all day. I couldn't sleep last night so I wrote some thoughts. Sorry my comment here is a bit long. If there was anything you both wanted to accomplish with this fight/journey with cancer, it was to bring glory to Jesus, your Lord and Savior. And I would say you have accomplished, and continue to accomplish, even in your anguish, this lofty and difficult task. It is lofty in that so few try, let alone achieve, glorifying God in their daily lives as well as their philosophical/theological outlooks. And difficult in that you both were shining for Him in the midst of intense suffering, physical, emotional, and spiritual. He is your (plural) rock. He is your fortress. He is your deliverer. I Him you do trust. Praise the name of Jesus. You wouldn’t have it any other way. You couldn’t make it through with such dignity and peace any other way. "My hope is in the Lord, who gave himself for me, and paid the price for all my sins on calvary. For me he died, for me he lives. And everlasting light and life he freely gives." Chris, you and Janie shone for Jesus. In the midst of joy and pain and loss. Well done. We love you so. Chris,I want you to know that you are continuing to be in our prayers. It was a blessing to spend time with you last week and I hope to be able to serve you through this if at all possible...please let me know how I may do that. Blessings to you Brother!! Chris, I know you only through Carol and Jonathan and through the thoughtful email you sent to us in March, praying for Justin, quoting Isaiah 43. You said these words carried you and Janie through many times of difficulty and uncertainty as you traveled through the deep, rushing waters and searing hot fires of your cancer journey. I knew at that time and now again, that 1) your trials have only deepened and sweetened your love for Jesus and 2) the quality of that love is shown to be pure in that you would, in your deep waters, pray for others. Your Saturday posting is powerful to me on several levels, but here are two. One, the double rainbow. What a gift, what kindness of the Lord, to orchestrate this for you. The significance of two, the symbol of grace; it's a picture that will stick with me for some time, I'm sure. Two, your remark that Janie's passing was at a very pure moment. That speaks volumes about your faith and partnership; about the Gospel and Jesus' victory over death. Oh, God of rainbow grace, glorify Yourself through Chris in the days ahead as You make him an extraordinary, living testimony of the truth of Isaiah 43:1-2. I heard the news yesterday and have been thinking about you and Janie since. Though it has been a long time, I have many wonderful memories of you both as individuals and together ... a uniquely magical blending of two beautiful spirits. May your memories and your faith comfort you in the days, weeks, and years to come. My brother . . . How your heart must hurt and rejoice . . . God's gentle comfort to you, friend. "Joy and sorrow are this ocean, and in their every ebb and flow, now the Lord a door has opened that all hell could never close. Here I'm tested and made worthy, tossed about, but lifted up - in the reckless, raging fury that they call the love of God." I just heard today about Janie. She is sorely missed! I am thankful for the few times I was able to get to know her. Your family has always been on my "favorites" list! We'll continue to pray for you all. Virginia (I'll tell Bob tonight when he gets home from work)..